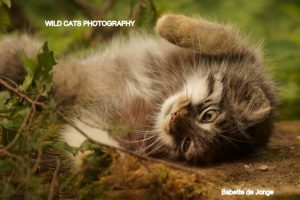 The Wild Cats World foundation has the best ambassadors to represent their species; the wild cats we care so deeply about. Below is the list of WCW ambassadors that are the prime examples of what we have been able to achieve so far. You can support our projects by symbolically adopting one (or more) of these magnificient cats. Also see Ambassador movies. 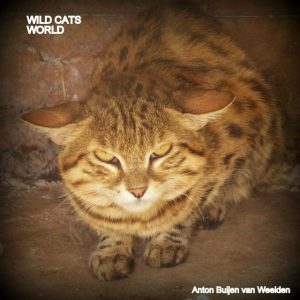 For information on all wild cat species, please check out the overview from WCW’s siter-site Wild Cats Magazine. “For a special WCW tour with first hand info about the WCW ambassadors and projects, write to info@wildcatsmagazine.nl. Felix was born November 7th 2011 in Hoopstad. We already had his sister Feline as a first ambassador leopard for the Wild Cats World project, and we were looking for a leopardfriend of the same age. We were shocked to find that Feline’s brother, Felix, still appeared on a Trading list, offering leopards, lions and other animals to the (Canned) hunting and petting industry mainly. We decided to have him come over and be the leopardfriend that we so badly wanted for Feline, to play with and just to be leopard with. It was a very emotional moment when they were firstly introduced to each other and Felix embraces his little sister. Feline was born November 7th 2011 in Hoopstad. She was moved to Cheetah Experience and Lizaene (of now Panthera Africa Big cat sanctuary) started raising her, when we got to know this very special girl. 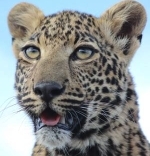 We were about to start our Leopard Conservation Project, and decided Feline would be the Matriarch of this project, our first ambassador of the species. Félipe was born October 1st, 2012, and came to us to be a partner of our female ambassador Feline. He also came from he famous list offered to all kind of wrong places in the petting and hunting industry, so we can indeed call it a rescue, offering him the best life possible, not being exploited in any way. Félipe successfully sired the two litters of Feline, with two daughters (Olive & Kali) and two sons (Beau & Bahati). 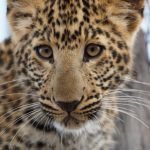 We sadly lost Kali, for sure due to clumsiness of Feline and the other female Felicia, but Olive as well as Beau & Bahati left on 16th of March 2018 for a soft release. And we are extremely proud of that. Felicia was born March 1st 2013 in Gauteng, South Africa. With her rescue and introduction to the other leopards, our Leopard Conservation Project SA made great progress. Below you can read the full story of Felicia, how she went “through wars” when she was a cub, and thanks to WCW founder/CEO Babette de Jonge she is still with us, alive and healthy. Spiky was an 8 months old male when he joined us and raised by his mother. Spiky was not used to humans as he grew up with his parents on a huge piece of land with little human presence. It was funny to see that it was Spiky who adapted easier to the “new People” and surroundings than his little girlfriend Speedy. Both fortunately do like each other so for the time being they can keep each other company. Female Speedy came to us as a 6 months old cub in january 2014. She was raised by her mother in captivity. For cheetahs in captivity it is not necessary to be “tamed” but it is always better to keep them stress free (or socialised) as with all other species. Sunny is a young male cheetah who arrived at Wild Cats World in the summer of 2014. Like the other two cheetah ambassadors at the Spotted Cats Conservation Project, Speedy & Spiky, also Sunny is semi-wild, or motherraised. The Wild Cats World cheetahs will live in huge camps far from the other WCW projects, to give the cheetahs a relaxed and stress-free life, far from the tourist-zone. 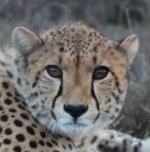 Joy was born in 2012 at Tenikwa, South Africa. She was motherraised like we love it best for our ambassadors. Her first boyfriend was a tame serval Diesel but sadly that wasn’t a good match.With her new boyfriend (2014) Turbo, who is less tame, it goes much better. Both servals seem to enjoy each other’s company a lot. Together they are part of the Spotted Cats Conservation project for servals in Eastern Cape, South Africa. 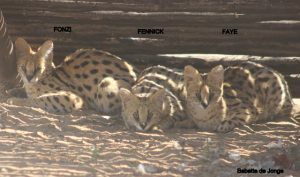 On April 1st 2017 we could welcome this amazing serval trio, kittens of our serval female Joy and male Norrick. For the coming time all three will stay with us and enjoy the best of care by mom and dad and our caretaker team. 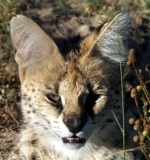 When more is clear about their future, we will make for each serval a special page, but they are already ready for (symbolical) adoption, for any one who likes to support them and their parents in the daily care, as well as allow us to do our conservationprojects for the species in their natural habitat. Leo was born in February 2012. 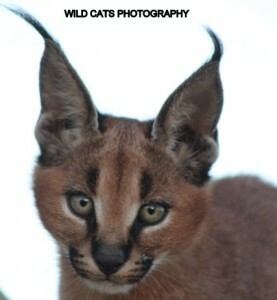 He is our second caracal ambassador. Our first one was the well-known Nina, who sadly was intentionally injured at a so-called sanctuary in Anna Paulowna, the Netherlands. 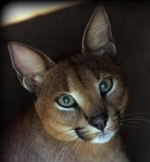 Leo was meant to be a couple with Nina, but after she died we decided to keep him at our caracalproject in South Africa, where he is now living in peace with caracal female Lea (DCP). On November 5th Nina (II) and her brother Thilido were born at our SCC project, S.A. with parents our male caracal ambassador Leo and (DCP) female Lea. We at WCW wanted at least one litter of this gorgeous couple and said from the start that a female born would be named Nina after our late caracal female who intentionally got killed in the Netherlands at Stichting Leeuw/Landgoed Hoenderdaell. Nina (II) truly honours the name of her late name-sake, and will be a great ambassador to her species alongside her parents and brother all staying with us at Spotted Cats Conservation under the best of circumstances. On Monday 31st of October we could finally welcome two new black-footed cats. Male Spotty and female Lilly. Not much info was given about the cats, as always they suddenly appear and farmers look for a good place for them to stay. While we are almost sure Spotty has been born in the wild, Lilly has a more gentle nature and the latest info we received from the farmers we got them from is that she is a captive born, and a handraised one. 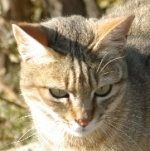 She is far less showing the usual “hiss and spit” behaviour compared to the other black footed cats we have and had in our project, so that could be the explanation. 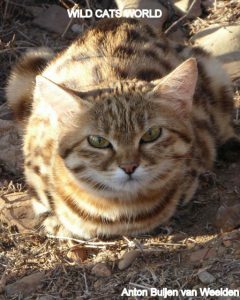 Also we were given a picture of a black-footed cat kitten that appears to be Lilly. Judging on these facts she is 1,5 years old now, so pretty young. On Monday 31st of October we could finally welcome two new black-footed cats. Male Spotty and female Lilly. Not much info was given about the cats, as always they suddenly appear and farmers look for a good place for them to stay. While we are almost sure Spotty has been born in the wild, Lilly has a more gentle nature and clearly wasn’t hissing and spitting like Spotty, and for which we know the species: small but fierce! 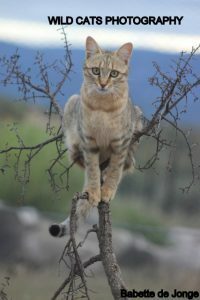 Only recently we started the African Wildcat project, part of our Spotted Cats Conservation Project in SA. Our first ambassador that arrived May 2013 is Sid. Sid was born August 30, 2012 at Cat Conservation Trust. 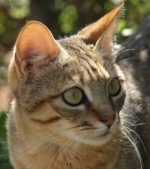 Louise, our female African wildcat, arrived at our project in August 2013, aged one. She makes a happy couple with our male Sid. Louise is also born at Cat Conservation Trust. Stars and her sister Sandy are born at Wild Cats World/Eastern Cape, September 20th 2016. 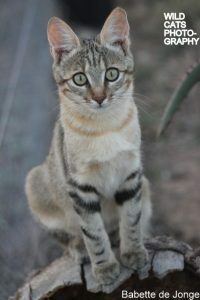 They are born in the second litter of African wildcat female Louise & male Max (with pure African wildcat genes). If they aren’t moving to another valuable place doing African wildcat Conservation, or aren’t released in a Private Game Reserve (mission of our conservation projects), all youngsters born at our sanctuary/conservation project will have a permanent home with us. 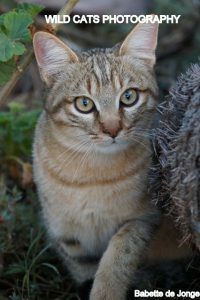 Hybrid- African wildcat male Ruben was brought to our sanctuary in 2014. The farmer asked if he could stay with us, otherwise he would shoot him. Ruben was accused being a chicken thief by this farmer. Of course we are there to rescue (wild) cats and keep them save from brutal killers like many farmers. We firstly brought Ruben to the vet for check up and necessary vaccinations and after that for him a difficult time started adjusting to a life in captivity. 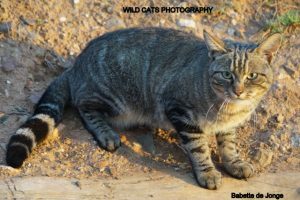 Being close to other cats, like first the black-footed females Diva & Beauty (neighbouring him) and now the African wildcat family, was his true rescue. He enjoys being part of the family, and soon forgot his fear and wild manners. Ruben has found a forever home with us and happily receives the daily necessary TLC and good food! France, raising funds for the PICA project also aiming to support the resident male and female in the Zoo, creating a great new home (enclosure) in the hope they are going to breed successfully, very essential for the species! To help us with this Lyon Zoo gave us permission to find (symbolic) adoption parents for the male or female (or both) in order to get funds in for the essential Pallas Cat Conservation program, supporting the wild species. 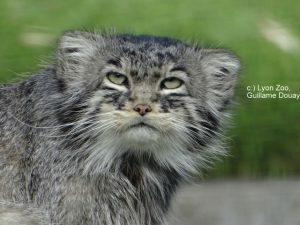 Lyon zoo has 2 pallas cats, a male and a female. Male Pallas Cat : No name, so we temporarily call him Lyon. Photos, permission by Lyon Zoo. They are part of the EEP (European Endangered species Programme) from EAZA (European Association of Zoos and Aquaria). This program is coordinated by Mr David Barclay ( RZSS Highland Wildlife PArk, Scotland). See all our Released or Relocated animals. For an overview of all our deceased animals, see our R.I.P. page.